On Wednesday, January 13, 2010, the Los Angeles Times published a page-one profile of two of Langer’s servers who also work part-time at Canter’s Delicatessen entitled “Double-dipping waiters sandwiched between two delis” by Robert Faturechi. 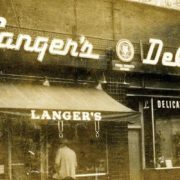 Langer’s Delicatessen-Restaurant enjoys an excellent relationship with The Los Angeles Times, having been profiled and chronicled in innumerable accounts over our nearly 63-year history. While we were generally pleased with the presentation of our hard-working, valued servers, the article described our location as being “surrounded by drug dealers and vendors selling fake IDs,” which not only misrepresents the MacArthur Park neighborhood but denigrates our many neighbors who work to bring a new vibrance to the area. Worst of all were unfortunate misquotations of Norm Langer which suggest he harbors negative thoughts about Canter’s Delicatessen and the Canter family. 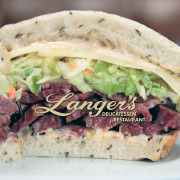 Everyone at Langer’s has nothing but respect for Canter’s – along with all the Jewish delicatessens here in the Southland. As David Sax noted in his recent book “Save the Deli,” Los Angeles is unique for our cohesive family of delis, which he calls the best in the world. 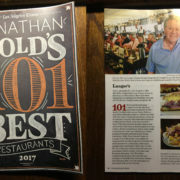 Our collective reputation is high because of the great efforts made by every Los Angeles delicatessen to serve the best food, with the best service possible, for every single customer. And in our book, Canter’s is a leading and unique member of the Los Angeles Jewish deli family, period. Everyone at Langer’s Delicatessen-Restaurant, from the owners to the managers and the employees, works hard to build and maintain the respect of our customers and the community. We are saddened that such a misquotation would be published and disparage our positive relationship with Canter’s Delicatessen and the Canter family. Langer's No. 19 - Olympic Diet? 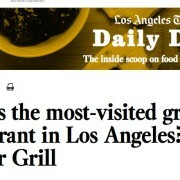 Los Angeles Times: Double-dipping waiters sandwiched between two delis National Pastrami Day at Langer’s!